This oil-free, hydrating SPF20 tinted moisturiser is an all in one skincare treatment and complexion enhancer. Its mineral pigments blend with the skin to cover skin imperfections, dark spots, redness, acne scars and blemishes, giving you a smooth, even radiant complexion. 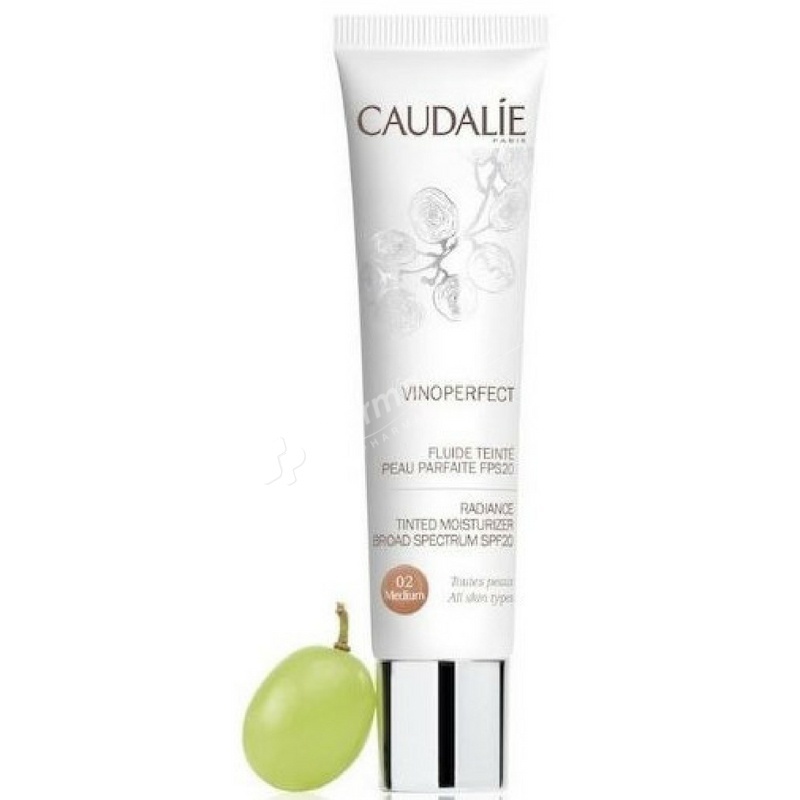 Vinoperfect Radiance Tinted Moisturizer Broad Spectrum SPF20 from Caudalie is a lightweight, complexion correction cream. Its unique, natural pigments blend with the skin to reduce the appearance of imperfections, dark spots and blemishes to deliver a healthy-looking, radiant complexion. The oil-free moisturiser provides a light veil of protection to shield skin from damage caused by the sun's harmful UV rays and leave skin hydrated with a natural glow. AQUA/WATER/EAU, DICAPRYLYL CARBONATE*, ETHYLHEXYL METHOXYCINNAMATE (OCTINOXATE), ISONONYL ISONONANOATE, BUTYLENE GLYCOL*, DIMETHICONE, METHYL METHACRYLATE CROSSPOLYMER, ISOAMYL LAURATE*, CETEARYL GLUCOSIDE*, CETEARYL ALCOHOL*, BENTONITE, SODIUM STEAROYL GLUTAMATE*, PARFUM (FRAGRANCE), STEARIC ACID*, PALMITIC ACID*, BISABOLOL*, BENZYL ALCOHOL, PALMITOYL GRAPEVINE SHOOT EXTRACT*, CAPRYLYL GLYCOL, DIMETHICONE/VINYL DIMETHICONE CROSSPOLYMER, TOCOPHEROL*, ETHYLHEXYLGLYCERIN, ACACIA SENEGAL GUM*, XANTHAN GUM, SODIUM GLYCEROPHOSPHATE*, CITRIC ACID*, HYALURONIC ACID, DEHYDROACETIC ACID, SODIUM PHYTATE*, LIMONENE, GERANIOL, LINALOOL, [+/- MAY CONTAIN : CI 77891 (TITANIUM DIOXIDE), CI 77491 (IRON OXIDES), CI 77492 (IRON OXIDES), CI 77499 (IRON OXIDES)]. (118/162) * Origine végétale - Origen vegetal - Plant origin.